BUYING a car sight-unseen can often be a bit of a lucky dip, as South Australian car detailer Steven Johnson can attest. After searching for a suitable donor FC wagon for his next project (he’s had six of them) he bought one out of Sydney and had it trucked down to his home in Mount Gambier. Unfortunately it wasn’t quite up to his standards. “It was painted with a spray can for starters,” laughs Steve, and the car was sent back. Another one was eventually found a little closer to home, in Monash, SA, and it was off to the sandblasters straight away. “You just don’t know what you’re dealing with until it’s blasted,” Steve says. Luckily, nothing too nasty was found, and the freshly sandblasted shell was handed over to Ashley Ward at Ward’s Rod and Customs, where it received new floor pans, a new trans tunnel, rust repairs and a custom one-piece tailgate. After the shell was returned, Steve got stuck in and sprayed the dash, engine bay and inside the car himself. “I love spray painting, just not getting the panels straight,” he says. All the stainless parts were sent to Ashley Ward for polishing, while Steve used his talents as a detailer to take care of all the bits and pieces that needed detailing. All of the FC’s iconic chrome work was also sent away for re-chroming before fitting. It was then over to Leigh Batchelor who sprayed the PPG Intense Orange on the shell and panels. With everything in orange, it was time for the white highlights, with Leigh and Steve adding some gold pearl to the white for added punch. Rather than going overboard under the car, Steve decided on simple chassis black. “I love to drive my cars; even in the rain,” he says. VS Commodore V8 super low springs and Monroe gas shocks hold up the front, while two-inch lowering blocks in the rear leafs and Pedders gas shocks keep the HR Holden diff (fitted with 3.08 gears) suspended out back. A heavy-duty sway bar helps keep the car on the straight and narrow. Making sure the FC stops are HR discs and calipers up front, with upgraded HR drums out back. A Gemini booster and XB Falcon master cylinder provide the brake pressure. Steve ordered some modern Billet Specialties rolling stock for the wagon, but after having them on the car for all of four weeks, decided they didn’t suit its style. They were swapped out for a set of the ever-popular Convo Pros – 15x6-inch wrapped in Toyo 195/50 tyres provide the steering, while 15x7.5s wearing 225/50 tyres handle the traction. Inside, comfort is provided by a pair of VS Statesman seats up front, while a custom rear seat retains the style of the original FC item, but with a facelift to match the modern buckets. A VS centre console now lives between the seats. Brand new door cards were sent to Darren at Signature Vehicle Interiors, who came up with the striking orange and white flame design, with grey plush pile carpet finishing off the package nicely. 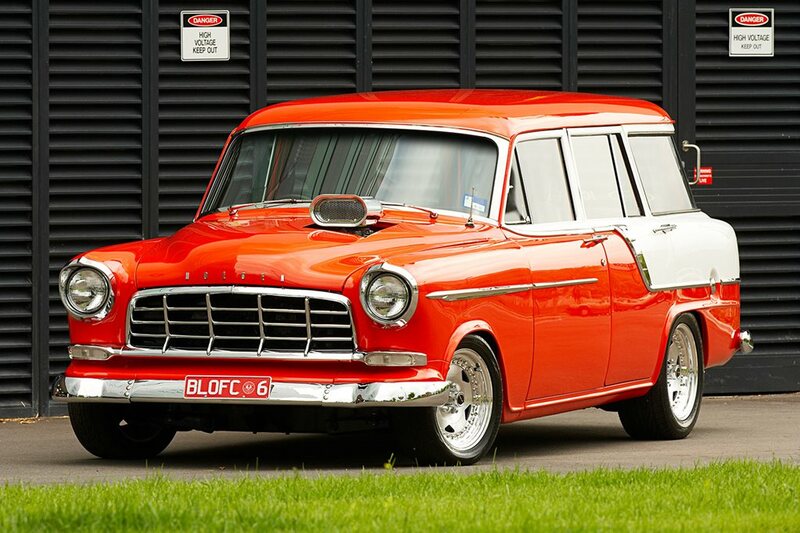 When it came time to find an engine for the wagon, Steven considered the 186 that was in the car from Sydney, but a quick tear-down revealed a sleeved bore and fairly sad cylinder head, so that combo was binned and an untouched 202 was sourced. This was sent over to David Munn who stripped down the six cylinder, and then forwarded it onto well-known engine builder Craig Carrison. He filled the red block with a balanced crank, Starfire rods, dished hypereutectic pistons, and topped it off with a ported cylinder head. A Crow camshaft and lifters supply the valve lift. Providing the induction is a Fisher 4/71 blower fed by a 600 double-pump Holley. “I always wanted a blown car and thought that a straight six would be a bit different to all the V8 and V6 variations getting around,” says Steve. “The engine sounds sweet. With the two-inch blower pulley, the noise is awesome.” Pacemaker extractors and a 2½-inch handle the burnt unleaded. Backing the much stronger 202 is a Celica five-speed gearbox and Xtreme heavy-duty clutch, with a shortened One-tonner tailshaft sending the power rearward. After blowing his budget on this build, Steve reckons another FC project is a long way off. “At least not until my two kids grow up,” he laughs.